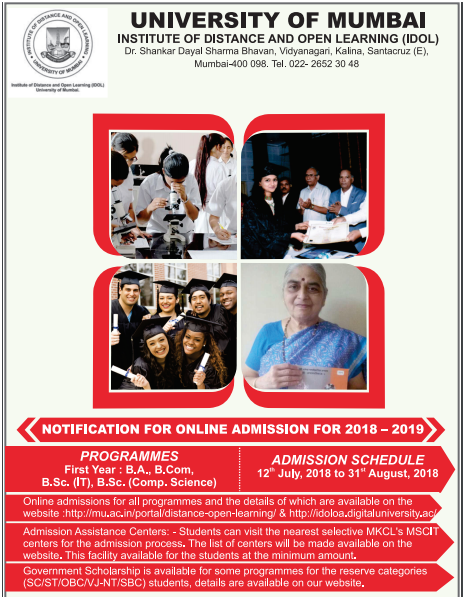 Why Mumbai University Institute of Distance & Open Learning (IDOL)? Mumbai University (MU) was established in 1857. It is one of the oldest universities located in Mumbai, Maharashtra. It also has the privilege of being one of the first three universities in India. Owing to the sheer number of students, Mumbai University is one of the largest universities in the world. Over 742 colleges are affiliated to the university. 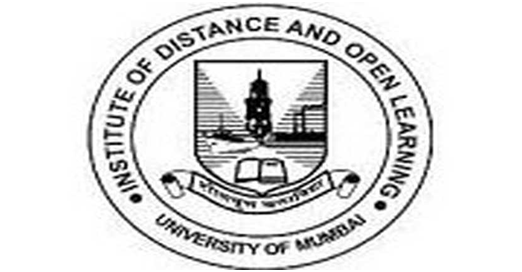 The Institute of Distance and Open Learning (IDOL) is the distance education segment of Mumbai University. Feeling the requirement for distance education for students who cannot enroll themselves into regular courses, Directorate for Correspondence courses was launched in 1971-72. The Mumbai University Distance MBA course is one of the most popular courses of the institute. IDOL accepts applications for various courses such as BA, B.Com, B.Sc among various undergraduate courses and as well as MA, M.Com, M.Sc, MCA, PGDFM (PG Diploma in Financial Management) and PGDROM (PG Diploma in Operations Research for Management) programs at the post graduate level for the academic year 2017-18. Candidates are required to give an Entrance Exam to join the MCA program. Candidates will be shortlisted based on merit with respect to the Entrance Exam. The University of Mumbai has been approved by UGC and NAAC. It is also a part of the Association of Indian Universities (AIU). All the programs of IDOL are approved by the Distance Education Council (DEC). B.A. (Psychology, Sociology, History, Political Sc, Economics, , Commerce, Education, English, Marathi, Hindi & Urdu) H.Sc (XII Std.) Or Equivalent Exam, Passed for admission to F.Y.B.A. B.Com. (Accounts OR Management Group) H.Sc (XII Std) Commerce or Equivalent Exam passed for admission to F.Y.B.Com. Post-Graduate Diploma in Financial Management A candidate for being eligible for admission – (a) Must hold a University degree in any faculty with 2 years working experience in any Organization or must have recognized professional qualifications and at least five year’s professional experience. (b) Must be residing within India. Post Graduate Diploma in Operational Research Management A candidate for being eligible for admission – (a) Must hold a University degree in any faculty with 2 years working experience in any Organization or must have recognized professional qualifications and at least five year’s professional experience. (b) Must be residing within India. Visit the official website of Mumbai University’s IDOL. Click on Menu and open the Registration form. Fill out the details asked. After the registration process is done, a User ID and Password will be generated and sent to your e-mail account that was provided at the time of registration. All the required information should be filled in earnest. A recent photograph and signature have to be uploaded. The next step is to login to your account and apply online to the desired course. All the required information such as Educational Qualification, Subjects, Documents, Questionnaire should be filled. Details of bank challan of online payments have to be filled. The last step is to save and submit the application form. If the candidate was pursuing related course from another university that was affiliated to Mumbai University and wants to transfer to IDOL, they are required to scan and upload the original No Objection certificate (NOC) of the current academic year from the concerned college and will have to submit the same with a photocopy of the document. Students who have completed their 3rd or 4th year Bachelor’s degree courses successfully form another University and completed another degree course such as B.Ed, L.L.B., M.M.S etcetera from a college that is affiliated to the University of Mumbai and wish to take up M.A/M.Com / M.Sc / M.C.A from the University of Mumbai are required to procure the Eligibility Certificate from the University of Mumbai, IDOL. These students will have to produce their Eligibility Confirmation letter from the earlier College or Institute affiliated to the University of Mumbai. Students that are eligible and wish to apply to the scholarship can submit their application through Social Welfare website. This is for students of the following categories SC / VJ (DT) / NT / OBC / SBC. Students under the ST category can apply through the Tribal Welfare Department website.